Every year I get together with four of my dearest friends from college for a long weekend of catching up. Scattered from Chicago to Vermont, and Alexandria to North and South Carolina, we’ve managed to carve out 4 days a year for over 25 years. We descend on the Sullivan’s Island, SC home of one of our group in late spring. Sunny but not-too-hot days are perfect for whatever we may want to do; this year it was kayaking and a palm tree painting adventure. The warm, slow evenings are our favorite, because this is when we drink wine, talk a lot and cook together. Historically a bunch of planner types (we have lightened up over time), we usually pick a theme for the food fest before we arrive. However, this year we decided on a smorgasbord approach – bring a recipe or two you haven’t made and we’ll experiment on each other. With enough variety on hand you can toss out the losers. Drink enough wine and it all tastes good! Dinner is served on the second floor piazza as darkness settles over the marsh. Music, laughter and the noises of insect nightlife can go on for hours. Old memories are summoned and new ones are made. The still waters of long standing friendships get deeper. One of our all time favorites was the coconut cake, delicious on a warm summer evening (or any time of year). Invite someone over and enjoy! Mix well and chill overnight. Bake the cake according to the directions in two 9” layer pans. Split the layers. Cover with icing made day before. Gently wrap and put back in the frig for 3 days before cutting. If you can’t wait 3 days, that’s ok! Just give it a little more time in the frig so the icing really soaks in. The act of sharing ranks right up there in my list of favorite things. For the most part, you “win” no matter which end you’re on – the sharing end or the receiving end. And it tends to spur more of the same. When my neighbor shared an oversized zucchini with me recently, it resulted in some zucchini bread for both of us. My dear friend was kind enough to allow me to share (read: unload) my concerns and frustrations with her at lunch last Friday. Getting all of that stuff out of my head and heart truly lightened my load – a pretty wonderful gift. And I’m more than willing to do this for someone else because I know how much it means. Whether you are sharing a plant from your yard or a word of encouragement; whether you are sharing with a friend or doing a random act of kindness for a stranger; sharing can have some amazing results. So today I’m going to share a simple recipe that someone shared with me. It’s a new hot weather favorite side dish from Bon Appetit. Enjoy! Rinse and drain chickpeas. Combine with chopped fresh basil, chopped Italian parsley, fresh lemon juice, extra-virgin olive oil, and pressed garlic clove in medium bowl. Add grated Parmesan cheese and toss gently to blend all ingredients thoroughly. 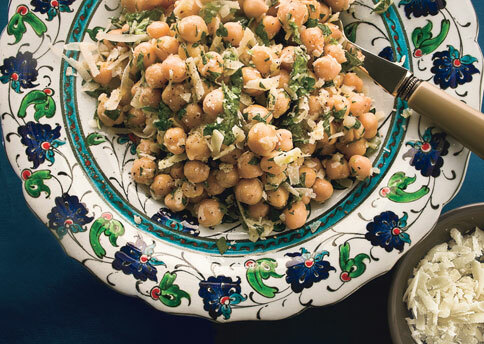 Season chickpea salad to taste with coarse kosher salt and freshly ground black pepper. Cover and refrigerate. Serve salad chilled or at room temperature. Can be done ahead!